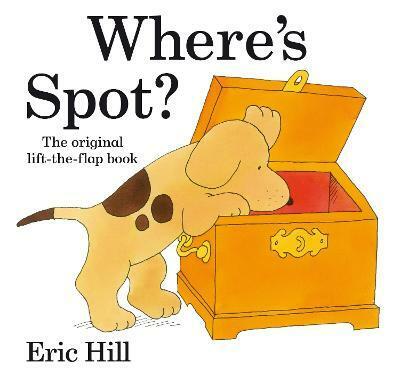 In Eric Hill's classic Where's Spot? lift the flaps to find Spot! In Spot's first adventure children can join in the search for the mischievous puppy by lifting the flaps on every page to see where he is hiding. The simple text and colourful pictures will engage a whole new generation of pre-readers as they lift the picture flaps in search of Spot. A No.1 bestseller since it was first published in 1980, this interactive favourite has stayed in the charts ever since. This is a bigger, brighter paperback edition of Eric Hill's iconic first lift-the-flap book. Eric Hill was born in North London and lived there for many years. He started his artistic career as an art studio messenger and from there went on to become a cartoonist and eventually an art director at a leading advertising agency. In 1978 Eric made up a story about a small puppy to read to his son at bedtime and Spot was born. The success of his first bestselling lift-the-flap classic 'Where's Spot?' in 1980 convinced him to become a full-time author. Eric currently resides in France.